Horse-drawn wagons and carriages mix with motorized automobiles in this old view of Main Street in Rockport. The photographer, Charles Cleaves, would have been standing at the corner of School and Main streets. Behind him would have been the post office and the Granite Shore Hotel. To the left in the picture is the front lawn of the Congregational Church. On the right side of the street, a woman walks holding a parasol. There are three signs above her. One reads, “Gloucester Electric Co.” Another, just below it, says, “Post Cards, Toys, Fine Candies, Etc.” I can’t make out the third. Farther down the street, beyond the wagon, where Main Street and Beach Street meet, the large sign says “Drugs” where Poole’s Pharmacy long stood. Along the left side of the street, you see the tracks for the trolley that ran from Gloucester through Rockport to Lanesville. It operated from 1896 to 1920. This card was published by the Rockport Photo Bureau. It has no date. Various clues — such as the presence of wagons and the age of the cars and markings on the reverse of the card — suggest this image is from roughly 1912-1915. 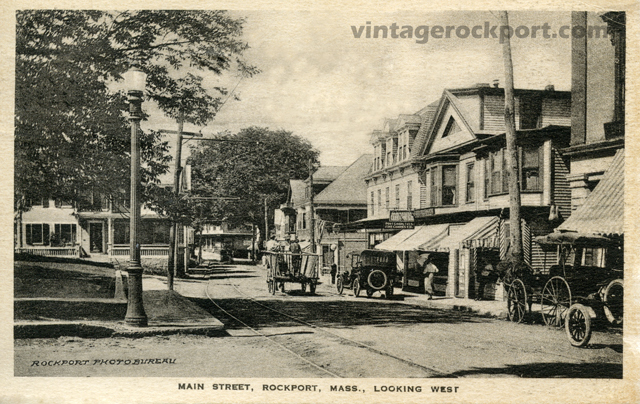 This entry was posted in Uncategorized and tagged Main Street, Rockport Photo Bureau. Bookmark the permalink. It’s interesting that in 100 years, so little has changed about that view – except the trolley tracks.